Franz Josef Glacier is hugely popular to all kinds of visitors. And that’s no wonder, when one realizes the facets this stunning piece of Mother Nature’s work has on offer. 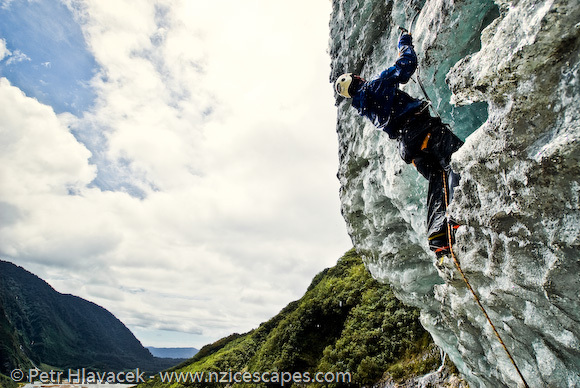 Besides its pure, mesmerizing blue, translucent beauty hitting us from every direction, Franz Josef Glacier has also its rough face, challenging many people with its ice climbing opportunities. The characteristics of this icy beast, combined with comfortable access, make this very easily possible. The steep and narrow valley works as a funnel into which Franz Josef slides from almost 3.000m above sea level. Once the body of ice gets into lower, steep and uneven valley floor, massive waves of ice are formed. These waves can be as high as 15-20 m and just scream to be climbed…and there is always plenty of those who can hear the call! This entry was posted on 03/08/2011. It was filed under Photography and was tagged with climbing, Franz Josef Glacier, glacier, ice, icefall, photography, Westland NP.